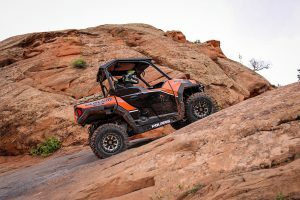 There is no doubt that the recent increase in sales of capable trail and sport UTV’s has fueled growth for the motorsports industry as a whole. 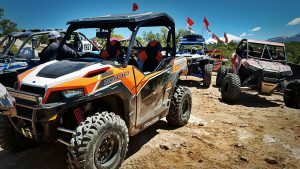 There are several machines on the market that lead in specific categories (horsepower, top speed, handling, cargo capacity, interior comfort, etc.). However, the all new Polaris General claims to blend several market segments into a single, well-rounded machine. 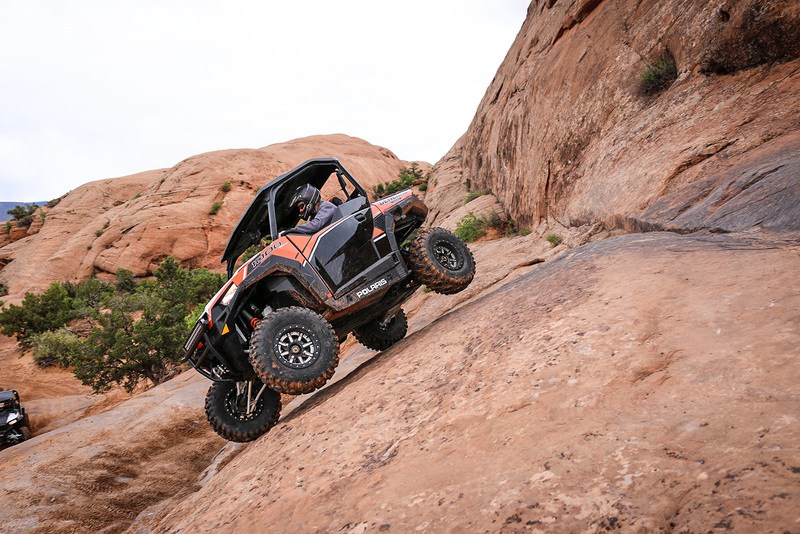 We put this boastful machine to the test on some of the country’s best rock crawling trails. 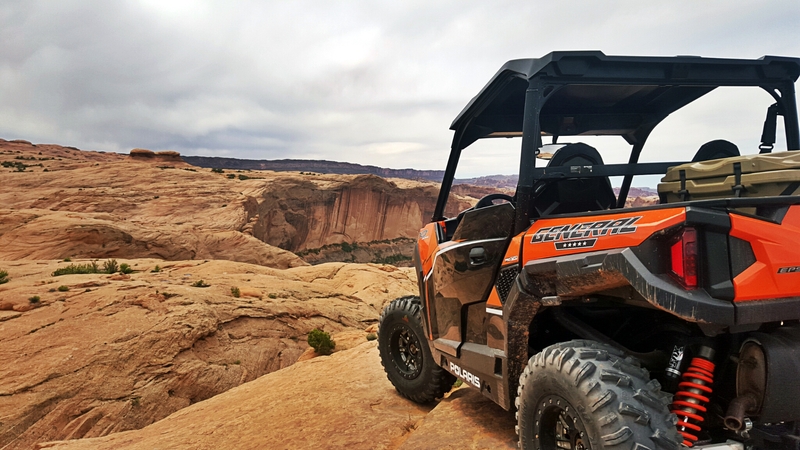 There are countless spectacular ride areas in this country, but none claim to be more awe inspiring than Moab, Utah. With its breathtaking vistas, heart pounding up hill climbs, and steering wheel wrenching cliff trails, Moab is seemingly purpose-built by God himself to be a prime destination for every outdoorsman. 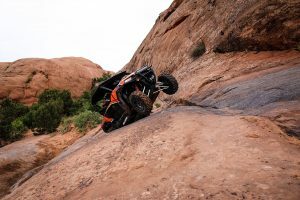 Each year, Rally on the Rocks brings thousands of participants and their UTV’s to the tiny town of Moab. With an estimated attendance of over 2000 spectators and upwards of 1000 UTV’s, Rally on the Rocks is expected to have injected over $300,000 into the Moab economy ensuring the continued operation of these amazing trail systems for years to come. Read more about Rally on the Rocks at http://www.rallyontherocks.com/. 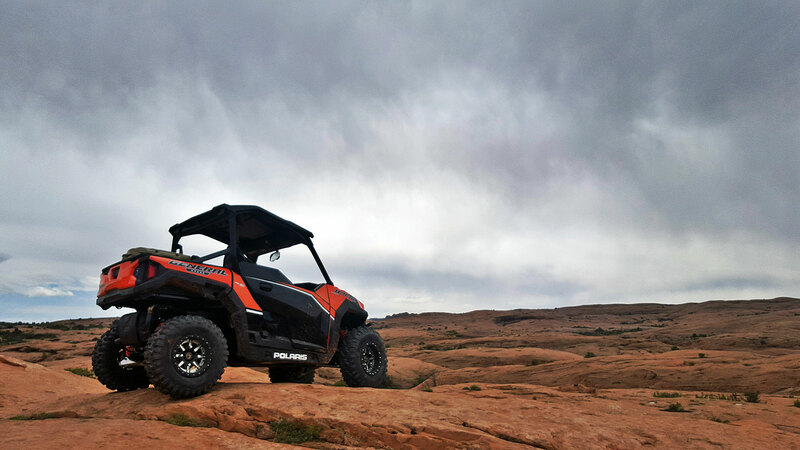 Along with #ProjectXPD, I carried a 2016 Polaris General Deluxe out to Moab. It fits perfectly on the back of my Volvo RV Hauler. 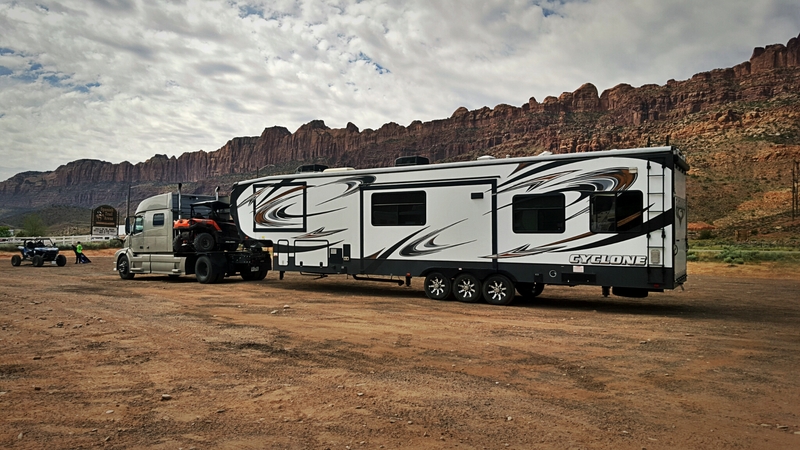 With integration of the tilt bed into the design and body lines, the General has created a very distinct look. 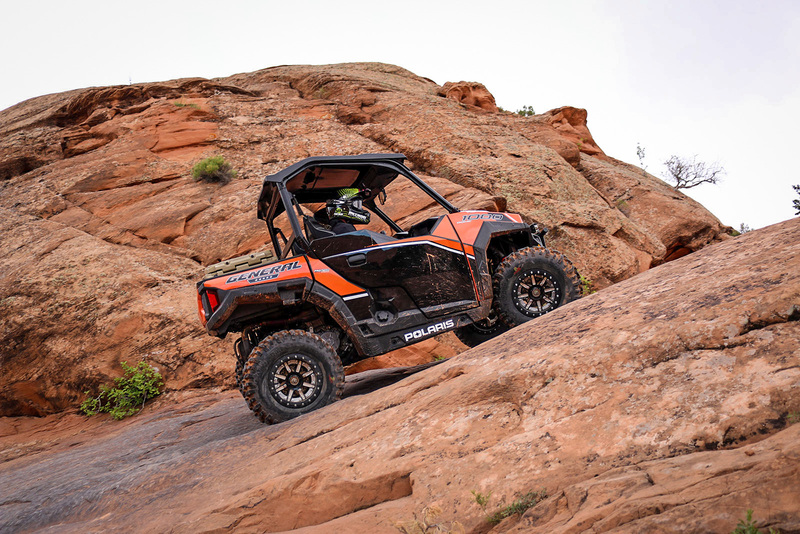 Keeping true to Polaris design cues, sharp lines and rearward sloping angles give the General an aggressive and muscular stance. 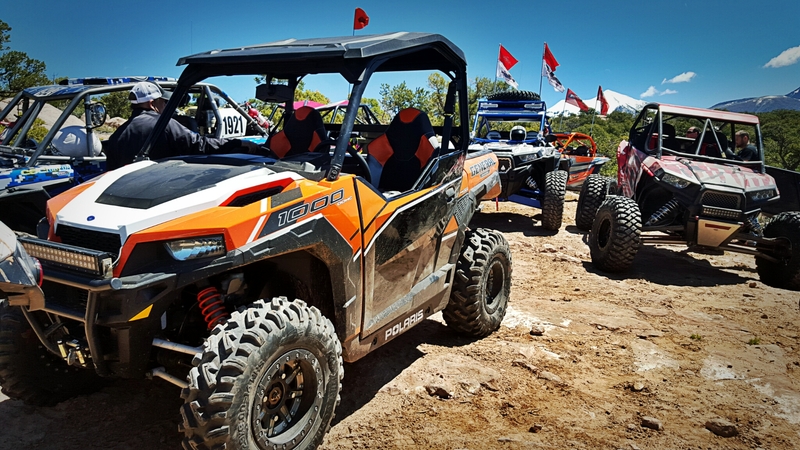 For 2016, the General is available in orange, red, and blue models. 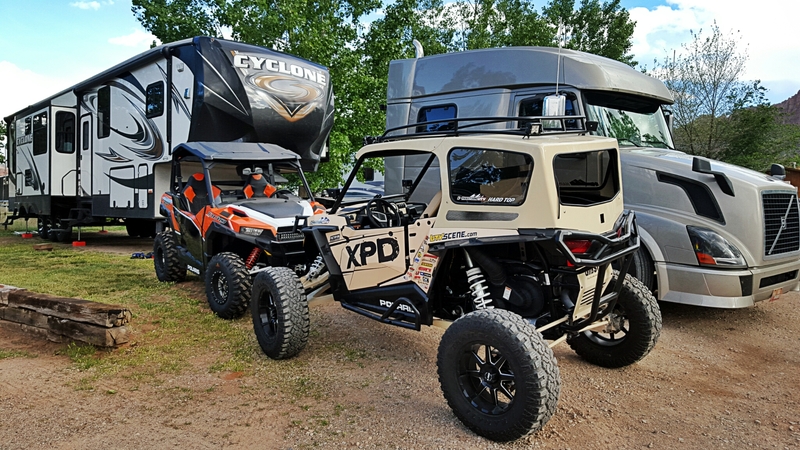 This is the highest quality door we have seen on any UTV to date. Not only does it look good from the outside, but it also incorporates an automotive style door latch and a full inner door skin building thickness into the door. On the inside of the door is a metal structure to provide rigidity. We have had some slight issues with door latch alignment. These issues were corrected by aligning the striker. 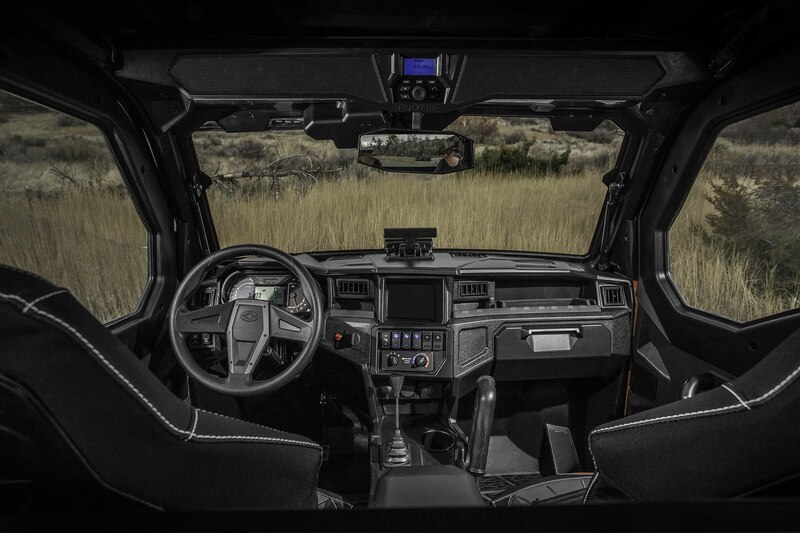 The interior of the General is on an entirely different level than previous Polaris UTV’s. The gauge cluster is driver-focused, highly visible and contains multiple readouts. It is also attached to the tilt wheel, ensuring that it stays in line with drivers of all heights. There are several storage pockets built into the dash, providing a place to store all of your smaller gear (cameras, phones, GPS, etc.). Another aspect of the General that takes it even further into the automotive realm is the use of a legitimate armrest. I never realized how much I missed armrests in UTV’s until I had one. That one simple change makes a big difference in the comfort level of this machine while out on a long trail run. Inside of the armrest is a good size storage compartment as well as a 12V DC adapter that is always on (not just ACC circuit). I also like how there is a recess cut into the rim of the storage compartment, between the lid of the console for my phone charging cable to run through without getting chopped off. There was a lot of thought put into this machine and the little things like this make that very evident. There is an additional 12V adapter on the dash. The passenger grab handle is also very substantial. It has a sturdy and strong feel to it. For seating in the General, Polaris also broke the mold of previous seat designs. The General seats are very comfortable featuring supportive side bolsters and a very effective non-slip material on the seat base and seat back. I am 6’2” and have zero issues wheeling the General all day. The leg room is perfect for me and the adjustable seat allows for anyone to get to their perfect position. Borrowed from the Ranger line, the General incorporates extruded steel tubing and cast corners to build extra strength into the ROPS (roll over protection system). 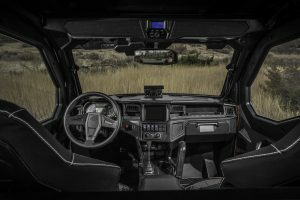 This extrusion also creates a channel for accessories like windshields, doors, and cab systems to seal tightly to the structure, another feature originating in the automotive industry. I have always been a racer, one who overlooked the usefulness of having a bed on a UTV. That all changed with the General. Not two days into having the General, I was hauling firewood in the bed. The General gives you a great tilt bed without having to drive around in a utility machine. The best of both worlds for me. The bed tilts easily and can be opened from either side of the machine. There is also a gas strut slowing the tilt and closure. 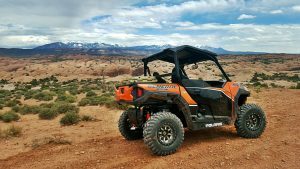 With the Deluxe model, Polaris installs a 4500 lb. HD winch. The winch is controlled by a switch on the dash. 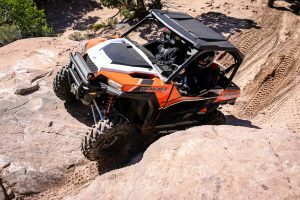 Being a huge fan of the new RZR platform, I was thrilled to see the General incorporating the suspension design from the RZR 1000 S. Dual a-arms on all four corners ensures maximum ground clearance and maximum articulation. 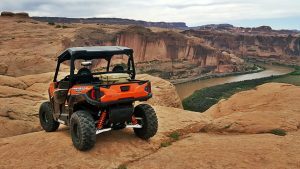 The Deluxe model also ships with adjustable Fox shocks which worked very well for everything I threw at it in Moab. 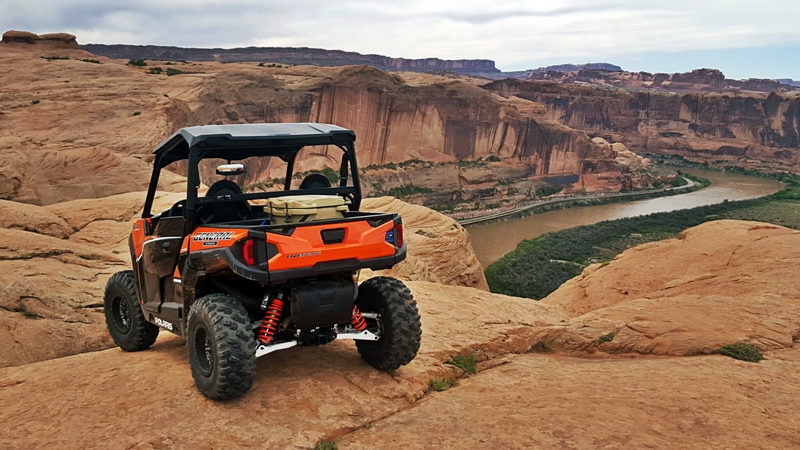 Huge thanks to Jon Crowley of UTV Guide for snapping some great photos of the General out on the trail at Moab. Check out his site for more UTV news. 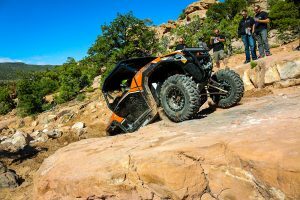 With incorporation of some of the RZR chassis/suspension design, also comes the engine from the RZR 1000. At 999cc, the engine produces class leading power at 100 HP and torque at 65 ft. lbs. The power delivery is very smooth comes on strong when you need it. The engine brake is a nice benefit as well. We have found that the engine brake works exceptionally well in low range. At slower speeds in high range, the engine brake is very aggressive. There are a few things I would like to see changed on the General. First of all, it needs better headlights. The basic OEM lights do not live up to the standard set by the rest of the vehicle. I added a 20” C-Series light bar from KC HiLites to supplement the forward lighting. The General ships with 27” GBC Dirt Commanders. I feel this is the best all around tire on the market, but the General really needs 29” tires. I bolted on a set of 14” HiPer dual beadlocks wrapped in 29” GBC Dirt Commanders. With zero clearance issues, the 29” tire is a perfect fit on the General. The winch incorporated into the Deluxe model is a great winch, but only having a switch on the dash to operate the winch makes operation by one person a little difficult. I would like to see a front mounted remote or wireless remote included. Polaris has a wireless remote kit which we will be testing very soon. 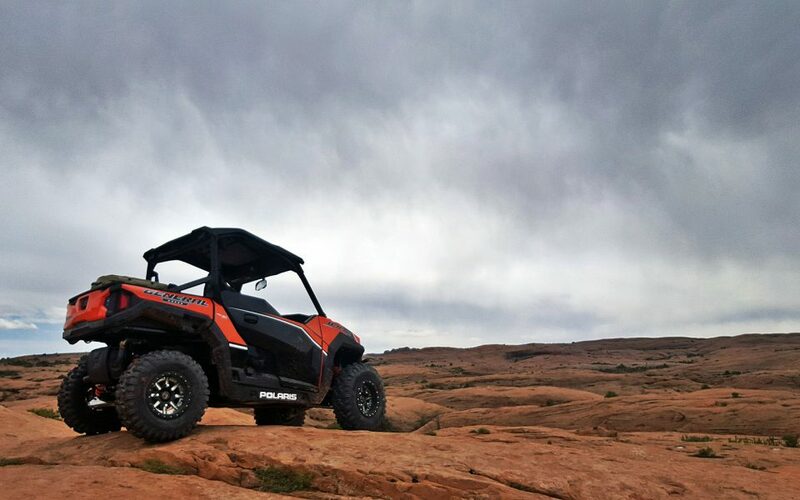 I feel the Polaris General is the best all-around UTV on the market. 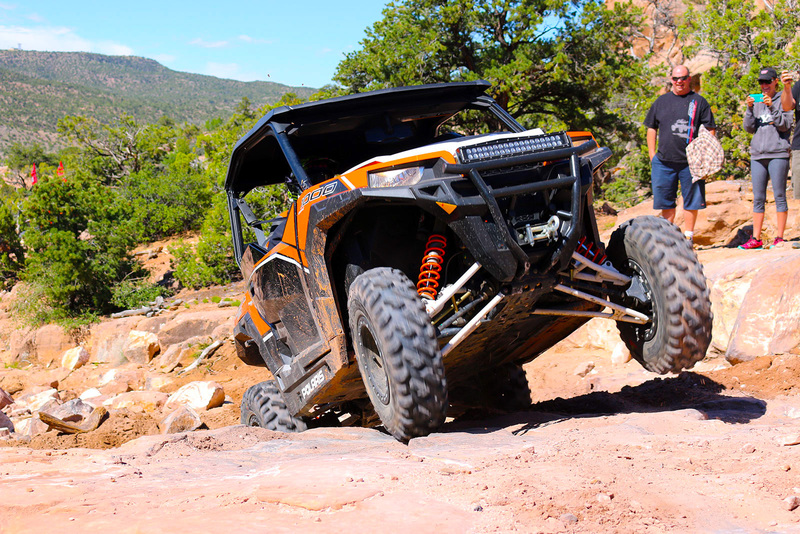 On every rock trail we ran it more than held its own in a field of 32” tires and high high horsepower turbo machines. It is also amazingly comfortable on long rides. These performance characteristics combined with the dump bed and utility-ability put this machine is a class all of its own. If you’re in the market for one machine that can do it all (sport, utility, comfort), your search should start with the Polaris General.